Mood board: Did somebody say Ibiza? Not exactly, but Acne creative director Jonny Johansson wrapped his models up in enough blanket dressing to cover an entire hippie island from spring to summer. 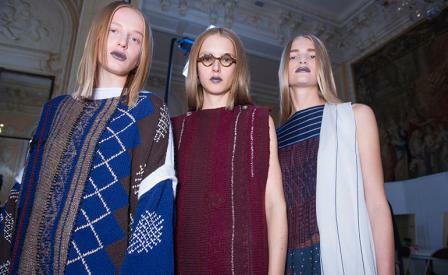 Shapes this season were completely unfurled from their usual complexity as Johansson channeled a new chill vibe in unstructured knit garments that hung off the models like draping carpets. Best in show: Tunic and wide trouser combinations looked great in Acne’s new earthy knits, but the coolest pieces were the new jumpsuit silhouette with a dropped crotch that was cut from ethnic carpets and Berber blankets. Finishing touches: Flat driver and dancer’s shoes were encrusted in dime-sized coloured crystals, adding a jazzy sparkle to the neutral palette, while wood print shoes had a built up curved sole like the arm of a chair.